As more and more details are released about the Republican tax scheme, it is clear that this bill is a gift to corporations, especially the oil and gas industry. The bill included a provision to allow oil and gas development on the Coastal Plain of the Arctic National Wildlife Refuge. We have seen the damage that oil spills have caused in other communities, and new drilling in America's wildest landscape would only risk more destruction and set a dangerous precedent for our most cherished public lands. Sen. Cory Gardner, who supported this tax scheme, voted to end protections for an area first set aside more than a half-century ago by Republican President Dwight Eisenhower and maintained by three decades of bipartisanship. Sen. Gardner should be ashamed they are handing over our public lands to oil companies that rake in billions in profits. Coloradans remind Sen. Gardner that Colorado voted overwhelmingly Democratic in the last election. Preservation of America's last remaining wild places is an inherently Democratic value. Shame on you, Sen. Gardner. The lawsuit against Exxon, Chevron, BP, Shell and ConocoPhillips is the latest from a coastal city seeking to hold fossil fuel producers accountable. Superstorm Sandy flooded New York's subway and highway tunnels, buildings and parking garages in 2012, causing about $19 billion in dollars in damage there. The city has been developing storm surge protection plans as sea level rises. Credit: Andrew Burton/Getty Images. New York City is suing five of the largest oil companies over the billions of dollars it spends protecting the city from the effects of climate change, and it plans to divest its pension funds' $5 billion in assets involving fossil fuel producers, Mayor Bill de Blasio announced Wednesday. As head of the nation's largest city, de Blasio is throwing significant weight behind a movement by local governments to directly target fossil fuel companies for the role their products play in fueling global warming. "They are the first ones responsible for this crisis, and they should not get away with it anymore," de Blasio said at a news conference held in a building that flooded when Hurricane Sandy hit the city in 2012. "It's time for them to start paying for the damage they've done." With the divestment plan, the city's pension funds are among the largest investors globally to announce their intention to sell their fossil fuel holdings. And by filing suit, too, New York is jumping into an international fight over who should pay the growing costs imposed by a warming climate. The lawsuit, filed Tuesday in federal court, seeks damages from the five largest publicly-traded oil companies-BP, Chevron, ConocoPhillips, ExxonMobil and Royal Dutch Shell-to help pay for the city's work adapting to climate change, including coastal protections and upgrading its sewer system. The suit requests a judgement determining the current and future costs incurred by the city and what portion the companies should pay for. The complaint cites research showing the companies' products have contributed more than 11 percent of all the greenhouse gas pollution since the Industrial Age began. It also says the companies "orchestrated a campaign of deception and denial regarding climate change" by funding efforts to discredit the science on climate change even though their scientists had warned them of the risks and the role of fossil fuels in causing it. The lawsuit follows similar cases filed last year by seven coastal cities and counties in California, including San Francisco and Oakland, against the same companies, as well as a larger group of energy producers. The class-action law firm Hagens Berman Sobol Shapiro is part of the legal teams for New York and some of the California jurisdictions. Michael Burger, executive director of the Sabin Center for Climate Change Law at Columbia University, said New York's lawsuit could raise the pressure on the companies, if the case proceeds and inspires others. "Any individual judgment is not going to be that big a deal," Burger said. "But if you're talking about cases being filed across 10 or 15 different states, and talking about forcing the industry to pay for adaptation costs across the country, it becomes a much different ball game. De Blasio announced the suit flanked by several climate activists, including Bill McKibben, the co-founder of 350.org who has helped lead the divestment movement, and Naomi Ages, Greenpeace's Climate Liability Project chief. Their inclusion could invite a charge from the defendants that they are being targeted in a game of politics. On Monday, Exxon filed a petition in a Texas court seeking to defend itself from the California civil claims. It argued that it was the target of a "collection of special interests and opportunistic politicians" who are trying to score political points. The company is seeking to depose officials in the California jurisdictions to establish whether it can seek claims against the local governments for abuse of process and conspiracy. Exxon has similarly charged that the attorneys general of New York and Massachusetts have conspired with activists in their investigation into whether the company misled investors about its climate risks. Exxon published a blog post Wednesday saying that while it "welcomes any well-meaning and good faith attempt to address the risks of climate change," it believes the lawsuits in California and New York "simply do not do that." The post added that the lawsuits seek billions of dollars from its shareholders. In moving to divest, New York would ensure it won't be among those. De Blasio and City Comptroller Scott Stringer announced a "goal" to sell the assets that its five pension funds hold in companies that own reserves of fossil fuels within five years. The first step will be seeking approval from the funds' trustees-which the mayor and comptroller said they were confident they could secure-to begin an analysis of how to sell the securities "in a responsible way that is fully consistent with fiduciary obligations" of the funds. At the new conference, both stressed that this would be in the funds' financial interests, both because energy companies have been underperforming compared to market indices and because any substantial global action to limit climate change could prevent the companies from exploiting all of their oil and gas reserves. In November, Norway's central bank recommended that that country's sovereign wealth fund sell its $35 billion invested in oil companies for similar reasons. McKibben, who has been watching the climate fight for more than 30 years, said: "This is one of a handful of the most important moments in that fight." Similar to the lawsuit, any individual divestment has only a limited impact, said Andrew Logan, director of the oil and gas program at Ceres, a nonprofit that promotes sustainable investment. "New York selling or not selling its shares isn't necessarily going to keep the industry up at night," he said. But if other cities or states follow New York's lead, "that does have real risks for the industry." De Blasio said at the conference that he and other city officials are eager to work with their peers around the country to replicate their efforts. Skopje's smog became so bad that the government offered citizens free public transport in an effort to get people out of their cars. Sarajevo, Tuzla and Zenica in Bosnia, as well as Kosovo's capital Pristina, suffer from similar high air pollution. A recent study by the Health and Environment Alliance (HEAL) found 16 ageing, communist-era lignite plants in areas of former Yugoslavia emit as much pollution as all of the European Union's 296 power plants combined. Under the EU's Industrial Emissions Directive, emissions in the region would have to be reduced by 90% for sulphur dioxide, by 67% for nitrogen oxides and 94% of airborne particulates by 2028. The Atlantic hurricane season was particularly active, recording three mighty category 5 hurricanes - Harvey, Irma and Maria - resulting in significant casualties. The cost of the damage across the American continent was in excess of $260 billion. In a world that is getting warmer, what does that mean and what might 2018 hold for weather across the globe? Are we destined to see more and more of these "unusual" and catastrophic weather events which result in significant devastation? What effect will climate change have on our weather and will this become the new norm? This pattern has a direct link to such phenomena as heatwaves, which are caused by more extreme temperatures. The links to droughts or periods of extreme low flows in rivers are more complex. Global Circulation Models (GCMs) - a collection of numerical models that provide a 3D analysis of global climate interactions such as atmosphere, oceans, ice and land - predict increases in temperatures for some regions, such as southern Europe. Last year was also the second driest since 1965. New data showed 2017 saw the highest average temperatures ever recorded in Spain, the country's weather service, AEMET, said on Wednesday. AEMET said that "2017 was an extremely warm year in Spain: the average annual temperature was the highest in the historical record, with an average temperature of 16.2ºC, a value that is 1.1ºC higher than the annual average" for the period between 1981 and 2010. Seven locations in the already hotter and drier southern and western regions of the country-Badajoz, Jaén, Granada, Córdoba Ciudad Real and Cáceres-posted new all-time record highs thanks to an especially warm two days in July. Granada airport took the prize for the hottest spot in Spain in 2017, reaching an official high of 45.7ºC on July 12, a full 2.7C higher than that weather station's previous record, back in 1972. "Of the ten warmest years in Spain since 1965, seven have been in years of the 21st Century and five of those have been in the current ten-year period that began in 2011. (It seems climate change is now noticable)", the service said on Twitter. Summer night-time minimums also broke records across the country, with temperatures in the early hours at the start of August not dipping below 26ºC in Madrid, 27ºC in Alicante or a sweltering 28.9ºC on the Balearic Islands. The previous highs in all of these places were prior to 1978, and in two places-Zamora and Alicante-the 1930s. Thermal anomalies in the average were above 0.5ºC for most of the country, "and close to +2ºC in many areas", AEMET said. As for rainfall, the Spanish Met Office described 2017 as a "very dry" year across the country. "Average rainfall in Spain was around 474mm, 27% lower than the annual average in the reference period between 1981 and 2010." That makes it the second driest year since 1965, only beaten by 2005, when average rainfall dropped to 468mm. "In an area between Palencia and Valladolid, another in western Extremadura and in parts of the Canary Islands, rainfall didn't even reach half of its normal level." It's January, yet methane hydrates in the Arctic are growling like an incensed monster on a scorching hot mid-summer day. But, it is January; it's winter, not July! On January 1st Arctic methane at 2,764 ppb spiked upwards into the atmosphere, which, according to Arctic News: "Was likely caused by methane hydrate destabilization in the sediments on the seafloor of the Arctic Ocean." (Source: Unfolding Arctic Catastrophe, Arctic News, January 2, 2017) Once again, with emphasis, it's January; it's winter, and there's little or no sunshine above the Arctic Circle. So, what gives? Why are alarming levels of methane spewing into the atmosphere in the dead of winter? For starters, record low sea ice volume, which has been dropping like a leaden weight for years because of human-generated (anthropogenic) global warming. That's a recipe for trouble, big time trouble as methane hydrates (lattices of ice that entrap methane molecules) get exposed to warmer water. In that regard, average sea ice volume throughout 2017 was at record lows. Making matters worse yet, extraordinarily warm water currents flow into the Arctic from nearby ocean waters that have been absorbing 90% of global warming. Ergo, Arctic water in thin ice does not cool down without a lot of thick ice to melt the warm water currents. So, abnormally warm water remains into winter months and, in time, reaches sediments at the bottom of the ocean, disrupting methane hydrates, which have stored tonnes of methane over millennia. However, in due course, all hell breaks loose with large-scale methane eruptions, one of those "Naw, it can't be happening" moments. Here's the problem: On average, sea surface temps were 23.35°F warmer during the period October 1 to December 30, 2017 compared to the 30-year average temperature. On October 25th, the sea surface was as warm as 63.5°F. For the Arctic, that's hot, not just warmer. And, that brings forth a big-gulp question: What's going to happen in summertime when methane hydrates are more exposed? After all, methane (CH4) is a dominating greenhouse gas that makes carbon dioxide (CO2) look like a piker during initial years and packs the walloping risk of runaway global warming, which, in turn, threatens agricultural sources of food… not a good scenario. Imagine the chaos, considering the fact that "runaway" means totally out of control! In all, an impending disaster seems destined to happen, but nobody knows when. It will likely occur unexpected by an ill advised, crass, blundering, philistine society blindsided by a scorched planet and extensive loss of foodstuff. Chaos spreads throughout when all of a sudden, unexpectedly, crops fail. One bad crop season follows another and another. For example, Syria, where its 2006-11 devastating drought caused 75% of Syria's farms to fail and 85% of livestock to die. That's a wipeout! In the end, as crops fail, it's too late to take remedial action beyond dealing with dystopian warring factions locked in bloodthirsty combat over morsels of foodstuff. Not only that, one more nasty early warning sign of trouble is right around the corner: The National Snow & Ice Data Center (NSIDC) January 3rd year-end headline reads: "Baked Alaska and 2017 in Review," stating: "… notably high temperatures prevail over most of the Arctic, especially over Central Alaska." That's permafrost country! That's where tonnes and tonnes and tonnes of methane lies in-waiting to spring loose into the atmosphere. After all, global warming is the kissing cousin to methane buried in permafrost. Meantime, the two poles, north and south, are in the early stages of collapse. Scientists know it, and there is lots of chatter about geo-engineering and assorted methodologies to fix anthropogenic global warming before it consumes civilization in a fireball, but those proposals are in dreamland for the moment. Hopefully, one of their fixit ideas works "to scale" because the planet is likely too big for geo-engineering schemes to work without some kind of unintended consequence, which may be worse than the original fix. In fact, nobody really knows for sure what will happen when the biosphere is forced to behave according to computer-designed plans. It's an enormous undertaking! Therefore, it is recommended that today's push-button, screen-watching youth learn survival skills rather than playing games for hours on end, endlessly, moronically pre-occupied with electronic fantasylands, because one day in the near future that fantasy turns to harsh reality, likely hitting hard, really hard. After all, eco-migrants, numbering tens of thousands, are already worldwide phenomena, especially along the southern and eastern Mediterranean Sea regions, where land is turning bone dry faster than anywhere else on the planet. It's the start of the Great Global Warming Migration scenario… but, pray tell, where to? Permafrost covers about 24 percent of the exposed landmass of the Northern Hemisphere-about 9 million square miles. It is found at high latitudes and high altitudes, mainly in Siberia, the Tibetan Plateau, Alaska, Northern Canada, Greenland, parts of Scandinavia and Russia. The continental shelves below the Arctic Ocean, which were exposed during the last ice age, also contain permafrost. In Alaska, permafrost temperatures have warmed as much as 2°C in the last few decades. A recent study projects that with every 1°C increase in temperature, 1.5 million square miles of permafrost could be lost through thawing. The 'active layer' of soil on top of the permafrost, which may be two to 13 feet deep, thaws each summer and can sustain plant life. This layer releases carbon from the roots of plants that respire out CO2, and from microbes in the soil. Some microbes break down the organic matter into CO2. Others, called archaea, produce methane instead, when conditions are anaerobic-when the soil is saturated with water or no oxygen is available. Methane is 20 to 30 times more potent than carbon dioxide at exacerbating global warming, but it remains in the atmosphere for less time. A 2017 study estimated that if global temperatures rise 1.5°C above 1861 levels, thawing permafrost could release 68 to 508 gigatons of carbon. Without factoring in human activity, this carbon alone would increase global temperatures 0.13 to1.69°C by 2300. Since we may have already locked in 1.5°C of warming above pre-industrial levels, this amount of additional warming could result in catastrophic impacts of climate change. Ben Gaglioti, a postdoctoral research scientist at Lamont-Doherty Earth Observatory, studied lake sediment records in northern Alaska to determine how much carbon the permafrost released in response to warming periods at the end of the last ice age. It turns out that the permafrost was much more sensitive-meaning it released more carbon-during past warming events, with gradually less response over time. In the most recent 150 years of warming, there has been relatively little response. Wildfires can peel back the peat and make permafrost more sensitive to climate change-and they're expected to increase in tundra regions, Gaglioti said. Warmer and drier summers make vegetation more combustible. Warmer temperatures also bring about more thunderstorms and lightning strikes that can spark wildfires. It can also harm natural ecosystems. Thermokarst lakes-depressions formed when thawing permafrost collapsed and filled with meltwater-are important for wildlife and provide water to local communities. But if the underlying permafrost continues to thaw, lakes and wetlands can drain completely, destroying these biologically important resources. People and animals and their diseases have been frozen in the permafrost for hundreds of years, but bacteria and viruses can survive in permafrost for hundreds of thousands of years-scientists recently revived a 30,000-year-old virus that infects amoebas. Diseases like the Spanish flu, smallpox or the plague that have been wiped out might be frozen in the permafrost. As the Arctic warms, more activity, like mining for rare earth or precious metals, could potentially put us in contact with them again. Snow comes later, melts earlier, and is not nearly as deep as it was 30 years ago. EU scientists are racing to help winter tourism regions adapt to climate change - but is manmade snow the answer? In the golden age of skiing during the 1960s and 1970s, snow was dependable at Lackenhof, which sits at 800 meters (2,624 feet) on the eastern edge of the Austrian Alps. But since the 2000s, it's unpredictable. Winter is retreating up the mountains. Global warming has already shut down scores of European ski hills outside the high alpine zones. Lackenhof could be next. "Last year, we had about 20 days, the year before, even fewer," mechanic Karl Oberreiter says, working on the control panel of a chairlift. "I don't think we've had a full season since the 1980s. There's a point where you can't do it anymore. After that, I don't know." Oberreiter's concerns echo across the across the heart of the Alps in Austria and Switzerland like a mournful yodel. 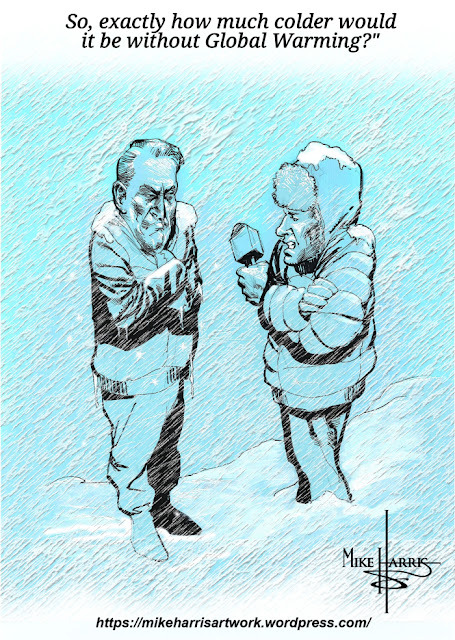 Winters are 10 to 30 days shorter than during the 1960s. By 2100, there will be almost no snow below 1,200 meters - an average elevation for ski towns. The overall snow cover in the Alps will decline 70 percent, according to recent climate studies. Preserving winter tourism and sports in the Alps beyond 2100 requires not just keeping global warming below 2 degrees Celsius, but the Paris Agreement's more ambitious - and many say, extremely unlikely - goal of 1.5 degrees. Even if that were achieved, alpine winters are expected to grow ever-shorter, before potentially stabilizing toward the end of the century in a warmer and much less snowy state. With the future of the ski and winter tourism industry at stake, a team of international scientists, partly funded by the European Union, launched the new ProSnow research project in November. It aims to make resort towns in the Alps more resilient to climate change by accurately forecasting seasonal snowfall and temperatures. Combined with long-term climate projections, this information is hoped to help alpine communities plan for the future - even making up for nature's shortfall with snowmaking and snow farming. The sad truth for many towns and ski areas below 1,000 meters is, in the coming decades most of their white magic will come from the business end of industrial snowmaking machines. Ski resorts around the world have already installed miles of water pipes and built reservoirs and pumps so they can make their own snow. Water is vaporized by thousands of high-pressure nozzles and freezes into a crystalline form that's almost like the real thing. Ski area operators have become snow farmers. Before the season starts, they use the snow guns to make big piles of snow in strategic spots on the mountain. Later, snow grooming machines distribute and smooth it out. Conservation organizations like the International Commission for the Protection of the Alps (CIPRA), have fiercely criticized snowmaking because of its energy consumption and disruption of ecosystems like tundra and streams. And some sustainably oriented mountain resort communities have rejected it in favor of a "soft tourism" path that's supported by both the German and Austrian alpine clubs. But ProSnow project leader Samuel Morin says snowmaking is here to stay, because resorts know that natural snow will be even less reliable in the coming decades. "Snow reacts immediately to climate change, and since the early 1990s, snow is no longer a certainty," Morin told DW. "The project was initially triggered by long-term climate concerns. And there is more variability now. The question is, to what extent can snowmaking and other technical measures counteract that?" It's a question that's also pertinent in California. Close to Mammoth Mountain Ski Area, about 300 miles north of Los Angeles, skier Jamie Shectman is waiting for snow after a bone-dry fall. He says you can't take the ski industry in isolation. A summer of destructive hurricanes and wildfires shows that globally, climate change impacts are intensifying, threatening lives and food production. More snowmaking may not be the most appropriate response. "There's a total disconnect between our sport and what's happening with climate change," Shectman told DW. "We know it's a high impact sport. From a karma perspective, the ski industry should be at the fore of the fight against global warming," he says. Instead of energy-hogging sources of greenhouse gas pollution, ski resorts should become self-sufficient producers of wind, solar, biomass and hydropower, Shectman says, describing his involvement in developing a solar power project at Mt. Abrams Ski Area, in Maine. Climate change is probably outpacing our technical capabilities to adapt, so slowing and stopping warming should be the priority. In just the past decade - the warmest in Earth's recorded history - the snow line rose between 1,200 and 1,500 feet in the northern Sierra Nevada. "The storms are not pushing over the crest like they used to. They don't have the same intensity any more," Shectman says. There are regional nuances to global warming impacts, and for some communities in the Alps, with access to renewable energy and high-elevation ski slopes, snowmaking could be an interim option to keep skiing alive. That includes the five alpine towns in France, Italy, Switzerland Austria and Germany that are part of the ProSnow pilot project this winter. All are in the mid-elevation mountain belt most susceptible to global warming. In Mayrhofen, Austria, at just 633 meters in the Tirolean Alps of Austria, winter snow cover has dwindled to nearly nothing over the past 30 years, and that pattern is widespread across Austria, Marc Olefs, a climate researcher with the with the Austrian Central Institute for Meteorology and Geodynamics (ZAMG) tells DW. Austrian winters have shortened by 10 to 20 days since the 1950s, and maximum snow depth has declined at all elevations and nearly all regions of the mountainous country, with small localized exceptions, Olefs says. He spreads a series of vivid maps on the table at his ZAMG office that clearly show how the biggest change to snow cover came in a big jump in the 1980s, when regional temperature increases surged to twice the global average. The maps are from a recent study that analyzed weather data from 1950 to 2016. With 66 years of data, the researchers were able to sort the long-term changes caused by greenhouse gas pollution from natural year-to-year fluctuations in snow. But their data also showed that, above 1,500 meters, winters may stay cold enough to maintain snow cover for at least a few more decades, especially if the world can start reducing heat-trapping pollution. The wide range of climate outcomes for 2100 and beyond show we need to take decisive action to protect the climate, Olefs says. The uncertainty, paradoxically, is also what why proponents say energy-intensive snowmaking such an indispensable part of the winter ski and tourism industry - at least for the foreseeable future. ProSnow team leader Morin says snowmaking is one of the main options for dealing with climate variability. He hopes the research will help optimize production of snow by giving resort managers specific information on when to make snow, and also, when adequate natural snow is forecast, to stop. Research organisation Deltares said the sea levels in the Netherlands have risen significantly since 1890. The country lies below sea-level and is protected from flooding by a series of defences. Bad storms can temporarily push water levels up by a meter, which accounts for an average rise of about one centimetre. "The level has been rising gradually since 1890 by about 0.2 cm per year due to the melting of the ice and the warming up of the ocean," expert Fedor Baart, of the research organisation Deltares, said on Friday. Sea and water levels are carefully watched in the Netherlands, as much of the country lies below sea-level and is protected from flooding by a series of defences such as dykes, sand dunes, windmills to pump away water and sophisticated barrages. In 2017, the institute measured the average sea levels along the Dutch coast to be 11 centimetres (over four inches) higher than normal water levels in Amsterdam, a gauge known as the NAP. The previous highest reading was in 2007 when the water was nine centimetres above the NAP. Bad storms can temporarily push water levels up by a meter, which accounts for an average rise of about one centimetre, Baart explained. The institute also highlighted that every 18.6 years the seas rise and fall by two centimetres on a tidal cycle. It stressed however that "the Dutch coast can cope with extreme water levels" and said "the sea level on the Dutch coast is rising by 20 centimetres every century". Dutch water defences were completely overhauled and improved after devastating floods in 1953 which left 1,800 people dead. One of the longest and most consequential campaigns against science in modern history is becoming more extreme-and turning against its originators. But now, just like the Republican upstarts that threaten the party establishment, Heartland is taking climate denial farther than many fossil fuel companies can support. While ExxonMobil today publicly accepts the reality of human-caused climate change and the need to address the problem, Heartland argues for the benefits of a warming world. The group is pushing the EPA to overturn its official conclusion-known as the endangerment finding-that excessive carbon dioxide is a danger to human health and welfare. The finding, affirmed by the Supreme Court, is what empowers the agency to regulate carbon dioxide and other greenhouse gases. ExxonMobil is among an early group of donors that slowed or ended its funding of climate denial. But the misinformation apparatus the corporations helped create is now so independent and robust, it no longer needs-or trusts-them. The narrative-that excessive carbon dioxide is beneficial for the Earth-is now backed by some in the EPA and the White House and is deployed as a weapon against the endangerment finding. One of Heartland's policy experts, Kathleen Hartnett White, who has called carbon dioxide "the gas of life," was nominated by the administration to lead the White House Council on Environmental Quality. There is a bright future for wind and solar power as they are rapidly becoming cheaper than fossil fuel electricity plants, according to a new study. According to a new cost analysis from the International Renewable Energy Agency (IRENA), within two years "all the renewable power generation technologies that are now in commercial use are expected to fall within the fossil fuel-fired cost range, with most at the lower end or undercutting fossil fuels". It expects renewables will cost between three and 10 US cents per kilowatt hour (kWh) by 2020, while the current cost spectrum for fossil fuel power generation ranges from five to 17 US cents per kWh. "This new dynamic signals a significant shift in the energy paradigm," said IRENA's Director-General, Adnan Amin, in a statement. "Turning to renewables for new power generation is not simply an environmentally conscious decision, it is now-overwhelmingly-a smart economic one," he added. Continued technological advancements are not the only factor helping drive down prices. The report found that the market was becoming more competitive and a number of experienced project developers had emerged in the sector. The best onshore wind and solar PV projects are expected to deliver electricity for three US cents or less by next year. But onshore wind and solar are not the only sectors becoming more competitive rapidly. The study found that new bioenergy and geothermal projects commissioned in 2017 had global weighted average costs of around seven US cents per kWh. IRENA said auction results suggest that two other technologies -concentrating solar power (CSP) and offshore wind-will provide electricity for between 6-10 US cents per kWh by 2020. "These cost declines across technologies are unprecedented and representative of the degree to which renewable energy is disrupting the global energy system," said Amin. The report was released on the first day of the eighth assembly of IRENA, which aims to be a global hub for renewable energy cooperation and information exchange by its 154 member countries. CONCENTRATION of Carbon dioxide, the most important greenhouse gas reached to 403.3 parts per million this year. According to scientists, this record annual increase of 3.3 ppm was partly due to the strong El Niño this year, which triggered droughts in tropical regions and reduced the capacity of "sinks" like forests, vegetation, and the oceans to absorb CO2. Average global temperature goes parallel with the concentration of CO2. In mid of 18th-century concentration of CO2 was below 250ppm. The rate of increase of atmospheric CO2 over the past 70 years is nearly 100 times larger than that at the end of the last ice age. As far as direct and proxy observations can tell, such abrupt changes in the atmospheric levels of CO2 have never before been seen. The major sources of CO2 emissions are burning of fossil fuels in factories, vehicles, ships and planes, deforestation and increase in population. The other two greenhouse gases are methane and nitrous oxide. CH4 is mainly generated by agricultural activities, the production of coal and gas, as well as waste treatment and disposal. Methane (CH4) is the second most important long-lived greenhouse gas and contributes about 17% of radiative forcing. Approximately 40% of methane is emitted into the atmosphere by natural sources (e.g., wetlands and termites), and about 60% comes from human activities like cattle breeding, rice agriculture, fossil fuel exploitation, land?lls and biomass burning. Atmospheric methane reached a new high of about 1 853 parts per billion (ppb) in 2016 and is now 257% of the pre-industrial level. Nitrous oxide (N2O) is emitted into the atmosphere from both natural (about 60%) and anthropogenic sources (approximately 40%), including oceans, soil, biomass burning, fertilizer use, and various industrial processes. N2O is mainly emitted by agricultural soil activities and chemical production. Its atmospheric concentration in 2016 was 328.9 parts per billion. This is 122% of pre-industrial levels. It also plays an important role in the destruction of the stratospheric ozone layer which protects us from the harmful ultraviolet rays of the sun. It accounts for about 6% of radiative forcing by long-lived greenhouse gases. The upward trend in CH4 and N2O emissions is also visible in the US, China, Japan, and India which all recorded increasing GHG emissions. In the EU, 60% of the CH4 and N2O emissions are emitted by the top six emitting countries - Germany, UK, France, Poland, Italy and Spain. Concentrations of carbon dioxide in the atmosphere surged at a record-breaking speed in 2016 to the highest level in 800,000 years, according to the World Meteorological Organization's Greenhouse Gas Bulletin. The abrupt changes in the atmosphere witnessed in the past 70 years are without precedent. Globally averaged concentrations of CO2 reached 403.3 parts per million in 2016, up from 400.00 ppm in 2015 because of a combination of human activities and a strong El Niño event. Concentrations of CO2 are now 145% of pre-industrial (before 1750) levels, according to the Greenhouse Gas Bulletin. Rapidly increasing atmospheric levels of CO2 and other greenhouse gases have the potential to initiate unprecedented changes in climate systems, leading to "severe ecological and economic disruptions," said the report. Population growth, intensi?ed agricultural practices, increases in land use and deforestation, industrialization and associated energy use from fossil fuel sources have all contributed to increases in concentrations of greenhouse gases in the atmosphere since the industrial era, beginning in 1750. "Without rapid cuts in CO2 and other greenhouse gas emissions, we will be heading for dangerous temperature increases by the end of this century, well above the target set by the Paris climate change agreement," said WMO Secretary-General Petteri Taalas. "Future generations will inherit a much more inhospitable planet, " he said. "CO2 remains in the atmosphere for hundreds of years and in the oceans for even longer. The laws of physics mean that we face a much hotter, more extreme climate in the future. There is currently no magic wand to remove this CO2 from the atmosphere," said Mr. Taalas. One of the Great Modern Hoaxes of the 20th and 21st centuries has got to be the notion of Global Warming. This is the meteorological phenomenon that happens when too many politicians talk about ways to take your money at once. All that exhaled carbon dioxide has been classified by the EPA as a ‘pollutant’ and so the political figures who go on and on about this impending doom are really creating it by the act of opening their mouths and speaking about it. Oh, wait. 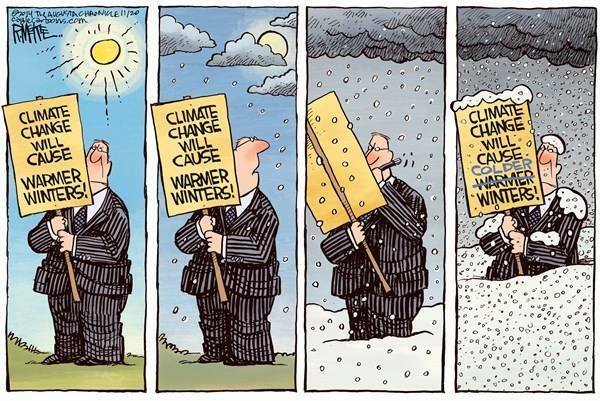 That’s not what Global Warming is… Let me try to correct myself. Global warming is when the planet overheats because of an excess amount of Carbon Dioxide, a trace gas in the atmosphere. This gas is so poisonous that it will kill people if you breathe it in pure form, and it will cause the earth’s atmosphere to trap the heat received from the sun, all the ice will melt, our cities will flood and we’re all going to die. This pinkish color is indicative of an ice thickness in excess of 50 cm, or about one and a half feet. The gray circle around the pole is probably just a circle of missing data, as can happen in some of these surveys. But it is about the trends, isn’t it? But what about the trends? Isn’t ice going away? Well, yes and no. In the Arctic it is significantly less than it has been during the period from 1981 to 2010. But that datapoint is still in excess of 12 million square kilometers of ice at present, and there is a lot of winter to go. The Antarctic has seen some different trends take place over the recent years. The overall trend for 30 years in this part of the world is an increasing amount of sea ice (though that did also drop in the last two years rather markedly). But most of you probably never see gloom and doom news about this. One thing that climate change believers hammer over and over is that the elimination of Arctic sea ice will kill polar bears (because “they have to swim farther for their food”). This is a dubious claim, however. Polar bears love to eat ringed seals, and the seals prefer in most cases to be on thick ice floes. However, their own food is likely more sparse in the middle of the Arctic ocean, because this ocean, like our others, is something like a desert when one is away from shore and the water is 10,000 to 12,000 feet deep with no islands. This is the case for the Arctic ocean. So while some seals will go far to the north, their food supply is relatively low. The greater amount of food is going to be found in shallower waters, which usually means that there is going to be land nearby for undersea plants and aquatic life to exist in greater quantity. So the seal population on shore is probably quite high, too, and this leads to some good eating for polar bears. There seems to be no connection between the polar bear population and diminishing sea ice. In fact, while sea ice levels have certainly shown a drop since at least 1970, the polar bear population has overall increased by some 16 percent, as written here. There does seem to be some population change by region, with the notable place of a population drop being around the north coast of Alaska and Western Canada. However, farther east there are two known areas of increasing population, with many further areas showing stability. This could simply mean that the bears may be moving from region to region. While they may be following the relocation of Arctic ice floes, it does not necessarily mean they are dying because there is not ice in a given area. So, the bears do not seem to be in trouble. Politicians and social activists, on the other hand, do seem to be in trouble. At the time of this writing, Drudge carried three pieces from activists all promising gloom and doom. The only one who is anything close to a scientist is the theoretical physicist Stephen Hawking. He insisted that the earth will become unbearably hot because of climate change “if something isn’t done” – and he offered the hyperbolic statement that anyone wanting to understand this situation should study or even go to Venus, where a runaway greenhouse effect is credited for that world’s ambient temperature of over 460 degrees C (864 F). Prince Charles of Wales was our second celebrity to trumpet the impending demise of us all, but he gave us a bit of reprieve. Whereas in 2009 he gave the world 96 months to “change our ways” or be consumed by heat-death, he has now graciously extended our live expectancy before doom to 35 years from now. One wonders what he wants to do that will take him 35 years to accomplish. The third doomsday crier is the one that actually also calls for the solution to this problem. Washington State Democrat Governor Jay Inslee gave the most dire warning of all: 59 days to save our children from global warming. But he has the solution to the problem as well, so we ought to consider what he says. You see, the solution to climate change / climate disruption / global warming / alien invasion / medical care / dogs and cats living together – is one thing. Governor Inslee wants his state to pass a tax on carbon dioxide emissions from power plants and other industries. About $950 million would go toward education programs. The rest would go toward green energy programs and research, water infrastructure, wildfire mitigation. Some money would offset taxes or go to poor families. This is all very well and good, except for the premise. The real issue here is a money grab. This idea sounds great on paper, but there is precious little said that explains how money is going to remove excess CO2 from the air. It does go a long way towards explaining how this politician wants to remove what he considers excess cash from your wallet. Who is the fool – the fool, or the fool that follows him? I am obviously not a believer in the climate change religion. I am also not a climatologist or a meteorologist, though I study these fields fairly extensively as a hobby. There is only one certain thing I can say about this matter, though, and it is reflected by scientists in virtually every field. When you think you are totally right, you’re likely to find out you have been totally wrong. Climate study is an extremely new science. We have many technical gadgets at our disposal now to help us study the history of climate. But we also have very limited understanding of weather even in as short term a forecast as 20 minutes, let alone one day, or one year. As it is winter in the Northern Hemisphere, I ask the reader to consider the accuracy of snowstorm predictions in your area. How often are they right? Have you ever noticed how erratic such forecasts can be? We can observe patterns, but I would opine that the book on what climatology is has yet to be written. We are learning, but it is absurd to say that we can know anything about this field right now. While I totally agree about the necessity of having a clean environment, this added scree about global warming and impending doom is a sad commentary on our wish not to be responsible. We have to be frightened into action, but then when it comes clear, as it has been lately, that the climate change hype is really a hoax and a fabrication, the end result might actually be rather unfortunate. However, everything that longer-term studies show seems to indicate that Mother Earth has regulated herself pretty well with and without human interference, and if anything, it is we who must be a bit wiser about where we settle and live and work, because we create our own problems when we defy nature. A good way to lose your home is to build it on a coast that risks exposure to a major hurricane, for example. A good way to make forest fires is to refuse to let nature control overgrowth naturally. We are learning these things. One hopes that we would learn more. It will make polar bears everywhere very, very happy. Probably the rest of us, too. One of the most brutal hurricane seasons in history recently came to a close. Seventeen named storms made their way through the Atlantic Ocean. For only the second time ever, two Category 5 hurricanes made landfall - both of which pummeled islands in the Caribbean. The residents of these small island states - and people in other island nations around the world - face an existential threat from future storms, which are growing ever more powerful because of climate change. These countries need assistance if they're to have any hope of mitigating the effects of climate change. Unfortunately, they're not getting it. At November's 23rd Conference of the Parties - an annual U.N.-sponsored forum of governments and environmental groups - developed nations declined to provide the aid they had previously promised developing countries. They also fought tooth and nail to avoid discussing how they would reduce their carbon emissions before 2020. This indifference is grossly unfair. Developed nations caused climate change, yet developing nations stand to lose the most from it. On the island of Barbuda, Irma damaged 95 percent of properties. Every one of the island's residents was evacuated and prohibited from returning for weeks, due to contaminated water supplies and an infestation of vermin. In Cuba, Irma destroyed roads, bridges and water infrastructure. Maria knocked out power to 3.4 million Puerto Rico residents and likely killed more than 1,000 people. Caribbean island nations aren't the only ones suffering from storms fueled by climate change. This year, Typhoon Damrey devastated the Da Nang region in southern Vietnam. It was the worst to hit the area in 16 years. In Bihar, India, floods killed 370 and left more than 12 million homeless. Developing countries, particularly island nations, are bearing the consequences of a problem they didn't create. From 1850 to 2011, developed countries produced 79 percent of global carbon emissions, which accelerate climate change by trapping heat in the atmosphere. Small island nations account for less than 1 percent of current emissions. Industrialized nations have talked the talk about helping developing countries adapt to climate change. But they're not walking the walk. Developed countries that signed the Paris Agreement in 2015 pledged to raise $100 billion each year by 2020 to assist developing countries. The agreement instructed developed nations to "communicate quantitative and qualitative information" about the funding to ensure developing countries could adequately prepare climate plans. But industrialized nations haven't provided this information - largely because they don't want to make firm financial commitments. At last month's Conference of the Parties in Germany, small, underdeveloped countries called them out. But by the end of the conference, nothing had changed. Since the pledging conference in 2015, in the last two years, the developed world had ponied up just $10.3 billion for the initial mobilization of resources for the Green Climate Fund. That's nowhere near enough. Developing countries will need up to $175 billion annually just to develop their economies on a low-carbon basis, according to the World Bank. Developed nations also aren't fulfilling their Paris Agreement commitments to substantially cut emissions by 2020, and that's alarming. Countries need to exceed these pledges, not merely meet them. Even if every country lives up to its initial pledge, global temperatures will still rise more than 2 degrees Celsius, triggering the worst consequences of climate change. At the Conference of the Parties, developing nations challenged the developed world to take concrete steps to reduce emissions before 2020. Why does 2020 matter? Up until then, the Paris Agreement puts the onus on industrialized nations to cut greenhouse gas emissions. After 2020, all countries, rich and poor, are supposed to make inroads on climate change. The longer it takes for global carbon emissions to peak, the more drastic subsequent reductions have to be in order to have a reasonable chance of staying below two degrees Celsius of warming - and the more we'll be forced to rely on future, unproven and negative emissions technologies. Developed countries didn't want to discuss the issue. In the end, they simply agreed to review progress on reducing emissions before 2020. Industrialized nations caused our climate crisis. Yet they appear to be reluctant to help the developing world - especially coastal and island nations - that will suffer most from unmitigated climate change. That's not right.